We have all learnt our A, B, C, Ds at school. These days another set of A, B, C, Ds are all the rage that are also edible! These are none other than the vitamin A, B, C, D, etc. Vitamins have umpteen benefits and we will be better off knowing a little more about them. Let’s take a look at Vitamin D benefits and how we can incorporate it into our daily routine. Vitamin D is a group of fat soluble steroids which aid in the absorption of calcium and phosphate by the intestine. There are 5 forms of Vitamin D and collectively they are known as calciferol. 1. Vitamin D1 is as molecular compound of ergocalciferol with lumisterol. 2. Vitamin D2 is made of ergosterol. It is produced in invertebrates, fungus, and plants in response to sunlight. Humans and other vertebrates do not produce Vitamin D2. 3. Vitamin D3 is made in the skin when 7 dehyrocholestrol reacts with ultra violet light. A human requires 10 to 15 minutes of sun exposure at least twice a week on the face, arms and back without sunscreen with a greater than 3 UV index for adequate amounts of Vitamin D3 synthesis. 4. Vitamin D4 is dihydroegocalciferol. 5. Vitamin D5 is made up of 7 dehydositosterol. Out of all these Vitamin D2 and D3 are most important. Although Vitamin D Is commonly called a Vitamin, it is not essentially a dietary vitamin because it can be synthesized in adequate amounts by most mammals, except cats and dogs. An organic compound can only be called Vitamin if it cannot be synthesized in sufficient portions and must be obtained from their diet. Before going into vitamin d benefits, look into its best sources and deficiency symptoms. Recommended amount — People under 70 years of age should consume 600IU of Vitamin per day and people over 70 should have 800 IU of Vitamin D per day. Symptoms of Vitamin D deficiency are often vague and nonspecific and are often missed. Many people have no symptoms as such, only tiredness and general aches. This deficiency is however just as disruptive to the body as any other vitamin deficiency functions. The deficiency is more often realized in severe cases with some bone deformities. Babies with severe Vitamin deficiency can get muscle cramps, seizure and breathing difficulties. This problem is mainly due to low levels of calcium. Children with severe deficiency may have soft skull and leg bones. “Bow legged” or curved leg is often a symptom of Vitamin D deficiency. Children may also complain of bone pains and muscle weakness. This condition is known as rickets. Vitamin D deficient children often have poor growth. Height is usually affected more than weight. Affected children also face difficulty in walking. Children with Vitamin D deficiency may be teething late as the development of the milk teeth is affected. Irritability is often due to Vitamin D deficiency. They are also prone to respiratory issues and infections. Breathing can be affected because of weak chest muscle. When rickets become very severe, it can cause low level of calcium in the blood. Vitamin D deficiency also causes cardiomyopathy, weakness of heart muscle. In case of severe deficiency, there might also be severe pain and also weakness. Muscle weakness may cause difficulty in climbing stairs or getting up from the floor or a low chair, or can lead to the person walking with a waddling pattern. Bones can feel painful to moderate pressure. People have a hairline fracture in the bone which causes tenderness and pain. Bone pain also occurs in the lower back, hips, pelvis, thighs and feet. Limited exposure to sunlight is one of the major and most common reasons for Vitamin D deficiency. Our body makes Vitamin D only if it is exposed to sunlight. Keeping yourself homebound will worsen the situation. The pigment melanin reduces the skin‘s ability to absorb Vitamin D. Thus darker skinned people are at risk of Vitamin D deficiency, especially older people with darker skin. Vitamin D deficiency also occurs if your kidneys fail to convert Vitamin D into its active form, as when people age, their kidneys are less able to convert Vitamin D into its active form. Obesity also affects Vitamin D absorption. Vitamin D is extracted from the blood by fat cells, altering its release into the circulation. People with a mass weight of 30 or greater often have low blood level of Vitamin D.
Certain medical problems also hinder vitamin D absorption. Disease like Crohn’s disease, cystic fibrosis and celiac disease can affect intestine’s ability to absorb Vitamin from the food you eat. Vitamin D plays a significant role in many of the major body functions and in absence of the right amounts can lead to what we refer to as vitamin D deficiency diseases. The probability of identifying and proceeding with vitamin D deficiency treatment is very low which why in this case prevention is better than cure. All pregnant and breast feeding women should take a daily supplement of 10 micrograms of Vitamin D daily. Infants and young children aged 6 months to five years should take a daily supplement of Vitamin D in the form of Vitamin D drops. Breast fed infants may need to receive drops containing Vitamin D from one first month onwards if their mother has not taken Vitamin D supplements throughout. People aged 65 years and over and who are not exposed too much to sun should also take daily supplements containing 10 micrograms of Vitamin D.
In addition, a doctor may advise routine supplements for people with certain gut, kidney and liver disease and prescribe certain medicines for people with darker skins. Here are the some of the benefits of taking vitamin D.
It helps the intestine to absorb nutrients, calcium and phosphorus. This ensures strong bones and a healthy immune system. Vitamin D prevents osteomalacia, which causes weakness in the muscular system and brittle bones. It is mostly prevalent in adults with Vitamin D deficiency. Vitamin D regulates blood pressure and reduces stress and tension. It also relieves body aches and pains by reducing muscle spasms. It also reduces respiratory infection. Vitamin D also helps to differentiate between cells, aids in insulin secretion and helps to fight depression. Vitamin D is recommended in the treatment of several diseases. It may prevent preeclampsia by improving kidney functions. It also prevents cancer by controlling abnormal multiplication of cancer. Research has indicated that people with low level of Vitamin D have a significantly lower risk of developing cancer, as compared to people with adequate level of Vitamin D.
Vitamin D optimizes our body’s ability to absorb other important weight loss nutrients, especially calcium. If our body lacks calcium, it can lead to up to 5 fold increase in fatty acids synthesis, an enzyme that converts calories into fats. By fuelling our bodies with Vitamin D rich nutrients, you can potentially lose weight up to 60 %. Vitamin D also improves eye sight of children. A couple of hours daily outdoors will help their growing eyeballs to develop properly and will prevent nearsightedness. A form of Vitamin D provides protection against damage from low levels of radiation. High doses of Vitamin D also help people to recover from Tuberculosis as quickly as possible. Low level of Vitamin D may increase the risk of heart attacks and early death. Vitamin D2 and Vitamin D3 are most beneficial for skin health. Vitamin D Cream or supplements can be effective for treatment of psoriasis. Vitamin D also repairs skin damage prevents infections that might be caused due to skin injuries and rejuvenate the skin. One of the most well-known uses for Vitamin D in terms of skin is its treatment of psoriasis. Psoriasis symptoms include itchy and flaky skin, which can heal by the topical application of Vitamin D cream or by having prescribed Vitamin D supplements. Vitamin D3 contains strong anti-inflammatory properties which make it effective for treating burns, skin injuries, skin damage and stretch marks. Thus vitamin D is mostly added in creams and lotions for its anti-inflammatory properties. Scientist are of the view that Vitamin D absorbed through limited exposure to the sun might prevent skin damage and sunburns by strengthening the skin. Lack of Vitamin D can also cause hair loss. Vitamin D is found in healthy hair follicles and is generally lacking in unhealthy follicles. Vitamin reduces stress, and depression has often been linked to hair loss and various other problems. It is always good to reduce stress and live a happy life. Vitamin D is also a precursor to the hair growth cycle. Vitamin D acts on the keratinocytes to initiate hair follicle cycling and stimulate hair growth. There are also Vitamin D receptors in hair follicles. Many different processes are involved in new hair formation from the follicle and Vitamin D plays a major role. Vitamin D receptors in the hair follicle have to be fed in the growing phase. This is why Vitamin D and hair deficiency go together. Studies have also shown that inhibiting Vitamin D receptors can cause hair loss. Depriving the body totally of Vitamin D will not provide necessary building blocks essential to hair growth. While Vitamin D deficiency leads to hair loss, the opposite might not be true. Overconsumption of Vitamin D will not lead to hair growth in itself. Once the hair follicle dies, it no longer goes through the cycle mentioned above. The hair follicle has to be active for Vitamin D to show any help. Thus it is important to prevent hair fall in early stages. There are number of different and healthy vitamin d foods, ranging from naturally occurring ones to supplements. Sunshine — A regular 30-minute stroll in the warm sun can provide you with plenty of vitamin D for the day, which is quite difficult to get otherwise. Salmon — Salmon has a high fat content, which makes it an excellent source of vitamin D. Around 3.5 ounces of salmon will provide you with 80% of the recommended dietary amount of vitamin D.
Supplements — There are two forms of vitamin D supplements – vitamin D2 and vitamin D3. The former, also called ergocalciferol, is synthesized from plants and yeast. This type of vitamin D supplement is most extensively used. The other form of vitamin D supplement is vitamin D3, scientifically known as cholecalciferol. This is the most active form of vitamin D. Since both vitamin D2 and vitamin D3 are not active in the body, they need to be metabolized into an active form in the body, which is called calcitriol. Mushrooms — Mushrooms are, in fact, the only plant source containing vitamin D. This genus grows in sunlight and is great at absorbing sunlight as well, making it a good vitamin D source. Mushrooms are also rich in B-complex vitamins like B1, B2, B5 and minerals like copper. Mackerels — Another fish variety with good vitamin D content. Mackerels have high amounts of omega-3 fatty acids. Just 3.5 ounces of mackerel can supply you with 90% of the RDI of vitamin D. Thus, people who consume more of these fish can get those essential minerals and vitamins that the human body cannot produce on its own. Cod liver oil — Cod liver oil has been a popular supplement for many years and is extremely rich in vitamin D, vitamin A, and omega-3 fatty acids. Consuming this oil regularly will promote healthy and strong bones, prevent osteoporosis in adults, and improve brain activity. Ricotta Cheese — Ricotta cheese stands out as the only source of Vitamin D among all milk by-products. It contains five times more vitamin D than other cheese. It contains a relatively high amount of vitamin D, around 25 IU per serving. Eggs — Eggs contain vitamin D in small amounts. Including one egg daily in your diet will provide you with 10% of the recommended dosage of vitamin D. Pasture-raised hens spend a lot of time outdoors. Hence, their eggs have the highest amount of vitamin D as compared to the other eggs in the market. Besides vitamin D, eggs are also a good source of vitamin B12 and protein. Cereal — Some forms of cereals also contain vitamin D. Before buying cereals, check the nutritional value on the label to get an idea about the percentage of vitamin D content. Choose the ones that contain at least 100 IU of vitamin D. All bran cereals provide 131 IU of vitamin D, while fruit-flavored cereals provide 11 IU of vitamin D.
Milk — One glass of milk will provide 20% of your daily requirement of vitamin D. Skimming of milk removes vitamin D as it is a fat-soluble vitamin. So, always opt for whole fat milk. 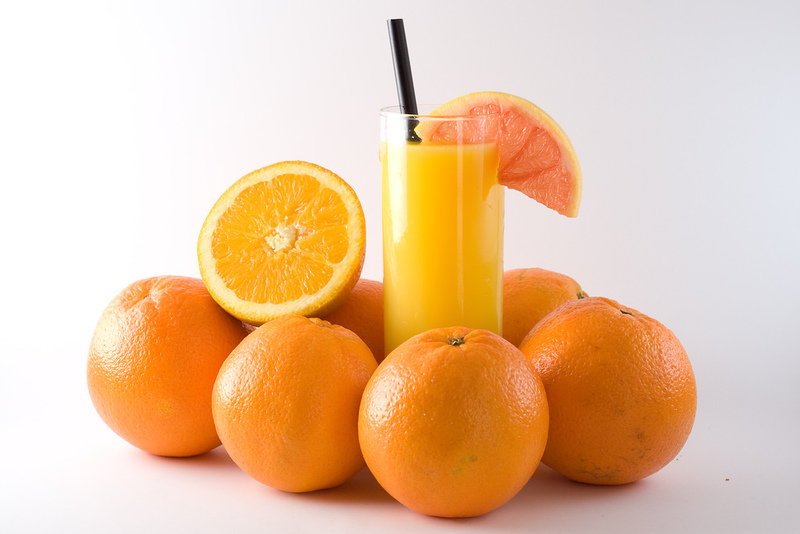 Orange Juice — One of the best vitamin d fruits. A glass of fresh orange juice is the best way to start your day. You can also consider packaged juices if fresh fruits are not available. This is perfect for those who dislike dairy products. Packaged orange juice is equipped with good amounts of vitamin D. One cup of orange juice contains 100 IU vitamin D and 120 calories. Soy Products — Every 79-gram serving of tofu offers 581 IU of vitamin D. One cup of plain light soya milk provides 338 IU of vitamin D while soy milk fortified with calcium and vitamins A and D provides 297 to 313 IU. You can also try soy yogurt as it offers 161 IU of vitamin D.
Shrimp — Every 85 grams of shrimp contains 139 IU of vitamin D. It has moderate amounts of omega-3s, protein, selenium, antioxidants, and less fat. You can indulge in this seafood without worrying about your weight. Butter — Good news for all the butter enthusiasts! While it is typically frowned upon by dieters, this ‘fatty’ food is known to contain a small amount of vitamin D. Butter is saturated fat, and it is essential to aid the absorption of antioxidants and vitamins by the body. It also assists in the absorption of vitamin D obtained from other sources. Always consider a doctor before popping pills as overdose of vitamin D can be harmful. Take vitamin pills on your doctor’s advice and enjoy the sunshine. Stay fit, stay healthy!